The territory which would later become the state of New York was settled by European colonists as part of the New Netherland colony (parts of present-day New York, New Jersey, Connecticut and Delaware) under the command of the Dutch West India Company in the Seventeenth Century. These colonists were largely of Dutch, Flemish, Walloon, and German stock, but the colony soon became a "melting pot." In 1664, at the onset of the Second Anglo-Dutch War, English forces under Richard Nicolls ousted the Dutch from control of New Netherland, and the territory became part of several different English colonies. Despite one brief year when the Dutch retook the colony (1673–1674), New York would remain an English possession until the American colonies declared independence in 1776. With the unification of the two proprietary colonies of East Jersey and West Jersey in 1702, the provinces of New York and the neighboring colony New Jersey shared a royal governor. This arrangement began with the appointment of Queen Anne's cousin, Edward Hyde, Lord Cornbury as Royal Governor of New York and New Jersey in 1702, and ended when New Jersey was granted its own royal governor in 1738. A 1685 reprint of the 1650 map Novi Belgii Novæque Angliæ showing Virginia, New Netherland, and New England. New Netherland (Dutch: Nieuw-Nederland) was the 17th-century colonial province of the Republic of the Seven United Netherlands and the Dutch West India Company. It claimed territories along the eastern coast of North America from the Delmarva Peninsula to southwestern Cape Cod. Settled areas of New Netherland are now constitute the states of New York, New Jersey, Delaware, and Connecticut, and parts of Pennsylvania and Rhode Island. The provincial capital New Amsterdam was located at the southern tip of the island of Manhattan at Upper New York Bay. New Netherland was conceived as a private business venture to exploit the North American fur trade. By the 1650s, the colony experienced dramatic growth and became a major port for trade in the North Atlantic. The leader of the Dutch colony was known by the title Director or Director-General. On August 27, 1664, four English frigates commanded by Richard Nicolls sailed into New Amsterdam's harbor and demanded the surrender of New Netherland. This event sparked the Second Anglo-Dutch War, which led to the transfer of the territory to England per the Treaty of Breda. Explored Delaware Bay, New York Bay, Hudson River. Established base at Nut Island (Noten Eylant) and outposts including Fort Nassau on Delaware River. Cape May was named in his honour. 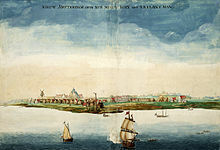 Initiated construction of Fort Amsterdam on southern tip of Manhattan Island, and Fort Wilhelmus on the Delaware River. Unpopular with the colonists, he was quickly replaced. Purchased the island of Manhattan from Native Americans on May 24, 1626 for 60 Dutch guilders worth of goods. Attempted to drive out Lenape tribe. Attacks on Pavonia and Corlears Hook, led to Kieft's War. Fired by the Dutch West India Company in 1647. Died at sea near Swansea, Wales on September 27, 1647 while returning to Amsterdam aboard the Princess Amelia. Authorized charter for Communipaw and Bergen (now Jersey City) in 1660. Surrendered New Netherland to the British. Apart from a short period between May 1688 and April 1689, during which New York was part of the Dominion of New England, the territory was known in this period as the Province of New York. For a list of Governors of New York state after independence (1777–present), see: List of Governors of New York. Director-General of New Netherland, for a list of the Governors of New Netherland from 1624 to 1664. ^ "Grant of Exclusive Trade to New Netherland by the States-General of the United Netherlands; October 11, 1614" from Documentary History of the State of Maine (Portland: Maine Historical Society / Bailey and Noyes, 1869–1916). Published online at the Avalon Project: Documents in Law, History and Diplomacy, Yale Law School, Lillian Goldman Law Library. Retrieved 6 April 2013. ^ Jacobs, Jaap. New Netherland: A Dutch Colony In Seventeenth-Century America. (Leiden: Brill, 2005), 35. ^ van der Sijs, Nicoline. Cookies, Coleslaw and Stoops: The Influence of Dutch on the North American Languages. (Amsterdam: Amsterdam University Press, 2009), 21. ^ Dolin, Eric Jay. Fur, Fortune, and Empire: The Epic History of the Fur Trade in America. (New York: W. W. Norton & Company, 2011) passim. ^ Versteer, Dingman (editor). "New Amsterdam Becomes New York" in The New Netherland Register. Volume 1 No. 4 and 5 (April/May 1911): 49–64. ^ Farnham, Mary Frances (compiler). "Farnham Papers (1603–1688)" in Volumes 7 and 8 of Documentary History of the State of Maine. (Portland, Maine: Collections of the Maine Historical Society, 2nd Series. 1901–1902), 7:311–314. ^ Parry, Clive (editor). Consolidated Treaty Series 231 Volumes. (Dobbs Ferry, New York: Oceana Publications, 1969–1981), 10:231. ^ Burrows, Edwin G., and Wallace, Mike. Gotham: A History of New York City to 1898 (Oxford: Oxford University Press, 1998), xivff. ^ Merwick, Donna. The Shame and the Sorrow: Dutch-Amerindian Encounters in New Netherland Early American Series. (Philadelphia: University of Pennsylvania Press, 2006). ^ "Journal of New Netherland 1647. Written in the Years 1641, 1642, 1643, 1644, 1645, and 1646". World Digital Library. 1641–1647. Retrieved 2013-08-01. ^ a b Shorto, Russell. The Island at the Center of the World: The Epic Story of Dutch Manhattan and the Forgotten Colony that Shaped America. (New York City: Vintage Books, 2004). ^ Otto, Paul. The Dutch-Munsee Encounter in America: The Struggle for Sovereignty in the Hudson Valley. (Oxford/New York: Berghahn Books, 2006), 152; and Kraft, Herbert C. The Lenape: Archaeology, History, and Ethnography. (Newark, New Jersey: New Jersey Historical Society, 1986), 241.